Recently Bangladesh navy published a circular in the post of commission officer “acting sub instructor leftenant and acting sub leftenant”. Interested candidates can apply for this post till 27 December. Educational Qualification: B.Sc Engineering on Naval Architecture / Mechanical / Electrical and Electronics Engineering. Minimum GPA 4.00 in SSC and HSC examination and CGPA 3.00 (4th scale) in B.Sc Engineering. Recruitment: After the final nomination, the post of permanent commission officer will be appointed as ‘acting sub-lieutenant’. Special allowance: After receiving the commission, a special allowance will be given at a time of 59,150 taka. Educational qualification: Bachelor of Science (Honors) in Psychology / Mathematics / English / Computer Science and Engineering / Chemistry / Materials / Law. Minimum GPA 4.00 in SSC and HSC examination and Honors (Honors) CGPA 2.5 (4 Scale). Recruitment: After the final nomination, short term commission will be appointed for 5 years for the post of ‘acting instructor sub lieutenant’. Afterwards, the application of the officer and the authority will be given employment / permanent appointment according to the rules. Special allowance: After receiving the commission, a special allowance of 42,250 taka will be given. 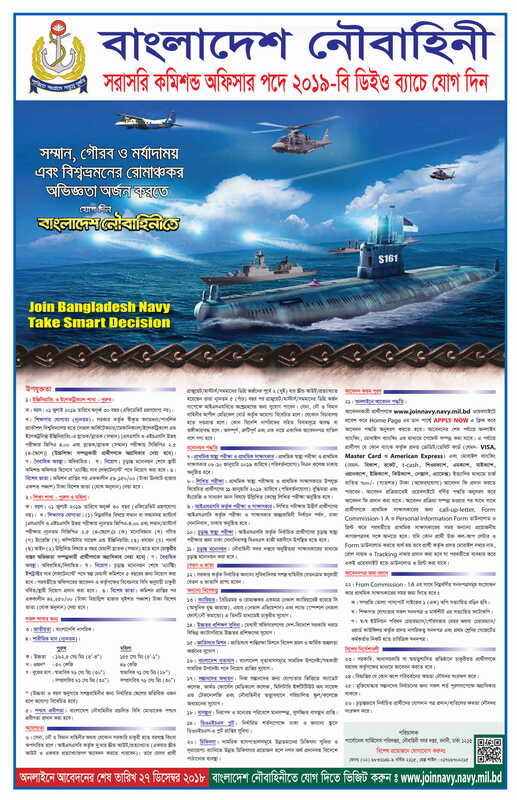 Interested candidates will have to enter www.joinnavy.navy.mil.bd website and fill up the online admission form and submit. An application fee of tk.700 / – will be paid through online banking or mobile banking at the end of the application. After completion of the application process, call-up-latter for the initial interview, download and print Form Commission-1A and Personal Information Form, a copy of a recent passport size photograph, all certificates of educational qualification, nationality and character certificates, during the initial interview. The copies will bring along. Candidates will be selected from among the candidates applying initially through health check-up and interview. Then a written test will be conducted on their intelligence, English skills and general knowledge. On 8th January, the primary health test and interview will be done at BN College Dhaka. The salary and allowances will be given in the Armed Forces, as per the pay scale, along with the other facilities, which are finally finalized. Apart from this, the meritorious officers are entitled to higher education in different categories of government and government expenditure abroad, opportunities for foreign travel and financial solvency in UN peacekeeping missions, cadet colleges, Armed Forces Medical College, Military Institute of Science (MIST) and Navy The colleges will be given the opportunity to study. To download the official notification, click the download button below. This page related to: govt jobs, government jobs, latest govt jobs, govt jobs 2018, govt jobs 2019, latest government jobs, government jobs news,government jobs circular 2018, government jobs circular 2019,bd govt job circular 2018, bd govt job circular 2019, all govt job circular 2018, all govt job circular 2019, government jobs in Bangladesh 2018,government jobs in Bangladesh 2019.